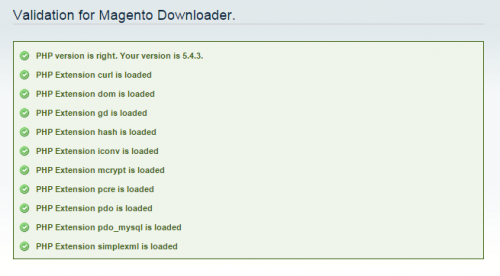 In This Tutorial we will see 9 steps the procedures of an installation via downloader Magento CE? The advantage of using this installation mode is that you need only send a file to the server. Thus saves time and reduces the risk of corrupted files. The disadvantage is that you need to necessarily have a connection to the internet at the time of installation, even if it is an installation on localhost . And the amount of steps is much greater. 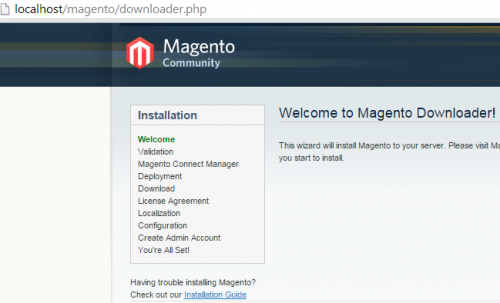 The first thing to do then is to enter the official site of Magento Inc. and download the installer. In this simulation was used to 1.9.0.1 version on localhost. The downloader will always download the latest stable version. Now you will unzip the file downloader.php and start the installation by informing the browser url installation /downloader.php . A server validation process is performed. Obviously all items must make a green check. Even at this stage you can enter the database access location, for the system to validate your database settings. It is not compulsory click Check , you can give a Continue . 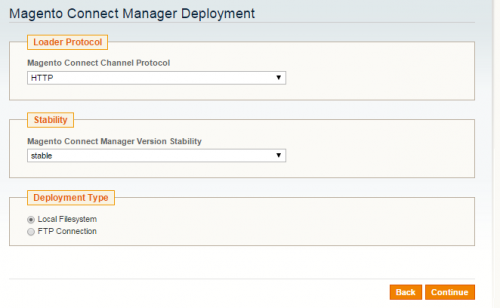 The system wants to know how you intend to manage the module installations of Magento Connect . 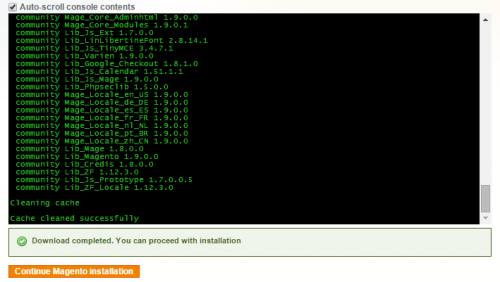 Wait a few seconds and see that there are various installation files in your directory. Just keep clicking Continue . Now The downloader system starts at this stage. When the download screen displays a " Download completed. You can proceed with installation "means that all files have been downloaded to your installation directory. From this step all installation modes are identical! Terms and conditions of use of the system in version OSL v.3 , you must accept to continue the process. Time to inform their regions, ie the language (English ), currency ( US Doller), and the timezone related to your schedule adjustment ( Pacific Standard Time). If Google Chrome presents cookie problems in this stage of the installation. Use another browser for the Magento installation. This is the most technical stage of the installation. 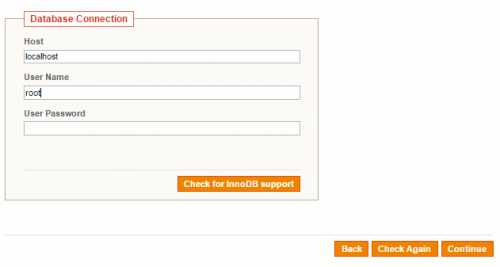 You need to re-enter the host, username and password of the database (database). If you use this database with other tables, enter the value " Mag_ "in the" Prefix Tables ", otherwise leave blank. If you enter a prefix, you must enter the same prefix in the SQL script to translate the database words. Enter the base url of your site ( www or localhost ). 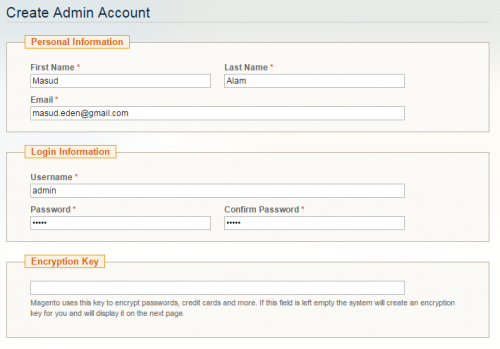 And the additional way to access the backend system ( / admin ). If you own the library mod_rewrite enabled on the server, check the Use Rewrites to make use of url’s friendly ( SEO ). If you select this option and do not have enabled library, will give problem . And finally indicate how the system should manage the sessions. Because it is a controversial topic among developers, the decision is up to you. When in doubt use the suggestion of Magento ( which has been marked ). It is time to create the first system administrator. Enter name, password, and contact email. You need to create a pro system security key. This key is used to encrypt data ( eg . : passwords ). If you leave it blank, the system will automatically generate a key. Your Magento installation this finished. You can now access the backend and start registering their products. Your frontend also already functional. 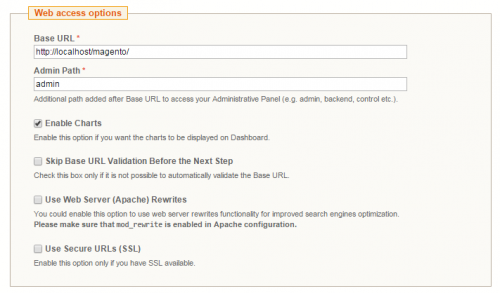 Enjoy the tips in this blog to personalize this frontend and configure your backend. 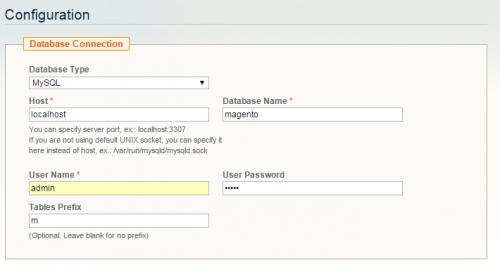 You can also install Magento CE by Full Release or SSH .